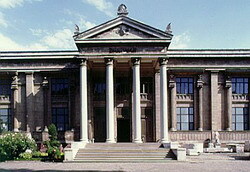 The Istanbul Archaeology Museum (Turkish: İstanbul Arkeoloji Müzesi) is an archeological museum, located in the Eminönü district of Istanbul, Turkey, near Gülhane Park and Topkapı Palace. The Great Palace Mosaic Museum (Turkish: Büyük Saray Mozaikleri Müzesi), is located close to Sultanahmet Square in Istanbul, Turkey, at Arasta Bazaar. The museum houses mosaics from the Byzantine period, unearthed at the site of the Great Palace of Constantinople. Istanbul Modern Art Museum (Turkish: İstanbul Modern Sanat Müzesi), usually just called İstanbul Modern, is a museum for contemporary art in Istanbul, Turkey, inaugurated in 2004. Jewish Museum of Turkey (officially Quincentennial Foundation Museum of Turkish Jews) is a cultural center established by the Quincentennial Foundation to inform the society of the traditions and history of Turkish Jewry. Rahmi M. Koç Museum is a private industrial museum in Istanbul, Turkey dedicated to history of transport, industry and communications. Rahmi M. Koç, member of the wealthiest dynasty in Turkey and retired boss of the Koç Group, founded the museum in 1991, which was opened on December 13, 1994. The museum is located in the suburb of Hasköy on the north shore of the Golden Horn and situated in two historical buildings connected to each other. It is open to public every day except Monday. The museum's director is Anthony Phillipson. The Sabancı University Sakıp Sabancı Museum is a private fine arts museum in Istanbul, Turkey, dedicated to calligraphic art, religious and state documents, as well as paintings of the Ottoman era. The museum was founded by Sakıp Sabancı, and was opened in June 2002. Aside from permanent exhibitions, the museum also hosts national and foreign temporary exhibitions and, hosts cultural events on the weekends. The Sadberk Hanım Museum is a private museum located at the Bosporus in Büyükdere, Istanbul, Turkey, which was established by the Vehbi Koç Foundation in memory of Vehbi Koç’s deceased wife Sadberk. The museum is open every day except Wednesday.